Silver Spring, Md. 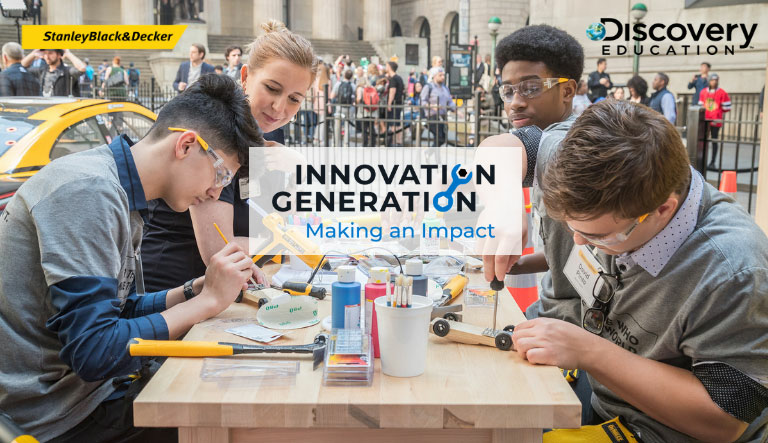 (Thursday, March 21, 2019) – Stanley Black & Decker, the world’s largest tools and storage company and leader in engineered fastening and security, and Discovery Education, the leading provider of standards-aligned digital curriculum resources, engaging content and professional learning for K-12 classrooms, today announced Innovation Generation: Making an Impact’s inaugural Concept and Create Virtual Field Trip. Nationwide, the digitally immersive experience is scheduled to premiere on Thursday, March 28, 2019 at 1:00 p.m. ET from Stanley Black & Decker’s Makerspace based in Towson, Md. The Concept and Create Virtual Field Trip experience will transport students across the country beyond the walls of their classrooms, into Stanley Black & Decker’s Makerspace, where they will learn science, technology, engineering, arts and math (STEAM) concepts from industry experts – including how teamwork can lead to technological advancements. Viewers are encouraged to register for the event, and join @DiscoveryEd and @StanleyBlkDeckr for a LIVE Concept and Create Virtual Field Trip Twitter chat using the hashtag #InnovationGenVFT. During the Concept and Create Virtual Field Trip, Stanley Black & Decker employees help students understand the process of building prototypes and walk them through core aspects of the Stanley Black & Decker Makerspace. Students will be challenged to develop Crash Test Cars and will engage with diverse STEAM careers in context – connecting them with examples of real-world applications. Exploring direct connections to vocational STEAM, young learners will also experience first-hand how math, science, technology, creativity and teamwork can lead to technological advancements in our everyday lives. Innovation Generation resources are available at no-cost at www.innovation-gen.com and within Discovery Education Streaming Plus, an award-winning comprehensive digital service supplementing instruction across all K-12 curricular areas. Discovery Education Streaming Plus empowers educators to create dynamic learning environments that mirror students’ use of technology outside the classroom. The Virtual Field Trip is part of Innovation Generation: Making an Impact, an initiative aimed to inspire educators and students in grades 6-10 to explore the innovation continuum. Powered by Stanley Black & Decker’s tools, including leading brands such as DEWALT, CRAFTSMAN, STANLEY, IRWIN and BLACK+DECKER, together with Discovery Education’s unparalleled classroom reach, Innovation Generation: Making an Impact fuels student learning and inspires the maker spirit within us all. Innovation Generation: Making an Impact complements Stanley Black & Decker’s existing maker-focused efforts, which include Makerspace collaboration initiatives with universities and other organizations, global apprenticeship programs, sponsorship of WorldSkills International, and the company’s Manufactory 4.0 initiative – an effort that encompasses job retraining efforts. Stanley Black & Decker also runs the STANLEY+Techstars Additive Manufacturing Accelerator program. Innovation Generation resources help students build the important critical thinking, collaboration, and communication skills needed for success beyond the classroom and support student achievement. Learn more about these no-cost tools at innovation-gen.com and at discoveryeducation.com. Stay connected through social media on Facebook, Twitter, Instagram and Pinterest @DiscoveryEd. Stanley Black & Decker is a $14 billion revenue, purpose-driven industrial organization. Stanley Black & Decker has 58,000 employees in more than 60 countries and operates the world’s largest tools and storage business, the world’s second largest commercial electronic security company, a leading engineered fastening business as well as Oil & Gas and Infrastructure businesses. The company’s iconic brands include BLACK+DECKER, Bostitch, CRAFTSMAN, DEWALT, FACOM, Irwin, Lenox, Porter Cable and Stanley. Stanley Black & Decker is a company for the makers and innovators, the craftsmen and the caregivers, and those doing the hard work to make the world a better place. Learn more at stanleyblackanddecker.com. Discovery Education is the global leader in standards-aligned digital curriculum resources, engaging content, and professional learning for K-12 classrooms. Through its award-winning digital textbooks, multimedia resources, and the largest professional learning network of its kind, Discovery Education is transforming teaching and learning and improving academic achievement around the globe. Discovery Education’s services are available in approximately half of U.S. classrooms and primary schools in the UK, and reach over 5 million educators and 51 million students in more than 90 countries. Inspired by the global media company Discovery, Inc., Discovery Education partners with districts, states, and like-minded organizations to empower teachers with customized solutions that support the success of all learners. Explore the future of education at DiscoveryEducation.com.